Product #22193 | SKU 226 | 0.0 (no ratings yet) Thanks for your rating! The Switchcraft 1/4" Mono Right Angle 2-Conductor Plug is designed for OEM development and users of commercial grade phone plugs. The plug is comprised of a handle, an insulator, and a finger/housing assembly. It features large terminals for easy 16 AWG wiring. For crowded wiring, the plug utilises a 1/2" wide low-profile design. 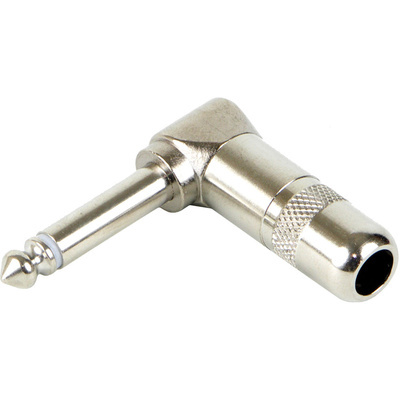 For secure connections, the plug features both knurled handles and a rugged cable clamp that prevents the wire strains from twisting or pulling out of the plug.